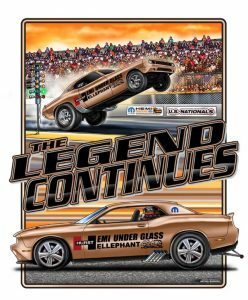 The famed wheelstander Hemi Under Glass, owned and driven by Mike Mantel will get an update in 2020 with the Challenger platform. The original ’68 Plymouth Barracuda Hemi Under Glass was conceived by Hot Rod’s Ray Brock as an idea to George Hurst of Hurst Performance. The promise was to stick the engine in the back over the rear wheels to scream off the line. But due to its ability to pull wheelies, it soon became one of the most viewed exhibition cars across the United States and Europe. Originally driven by ‘Wild Bill” Shrewsberry, then Bob Riggle from 1966 – 1975 and 1992, before being owned by Mike Mantel. For some the first sightings of the Hemi underclass was on Jay Leno’s Garage, driven by Bob Riggle, where the car took an unfortunate roll as in the video below. Fortunately, nobody was injured, but the video did bring the car to the wider masses and a brief look into such wild horse power levels. For the new version a Gen 3 426 Hellephant V8 will be used having enough power to pop a wheelie down a 1/4-mile straight, producing 1,000Hp and 950 lb-ft of torque. The original Hemi Under Glass will still tour with whatever new model is chosen and give fans a look into more than 50 years of history and how the brand has evolved over time. ← Previous Story Will The New Corvette C8 Be a Supercar?